Coastal residents fled to higher ground as a powerful earthquake sent a series of moderate tsunamis toward Japan's northeastern shore Tuesday and fueled concerns about the Fukushima nuclear power plant destroyed by a much larger tsunami five years ago. Lines of cars snaked away from the coast in the pre-dawn hours after authorities issued a tsunami warning and urged residents to seek higher ground immediately. The warning was lifted nearly four hours later. The magnitude 7.4 earthquake struck in the same region that was devastated by a tsunami that followed a much larger magnitude 9.0 quake in 2011, killing some 18,000 people. The U.S. Geological Survey measured Tuesday's quake at 6.9. It was the largest earthquake in northeastern Japan since the 2011 one and some large aftershocks the same day. The operator of the Fukushima Dai-ichi plant said there were no abnormalities observed at the plant, though a swelling of the tide of up to 1 meter (3 feet) was detected offshore. At least 12 people were reported injured, and Japanese TV images showed items scattered on the floor in a store, and books that had fallen from shelves in a library. The earthquake shook buildings in Tokyo, 240 kilometers (150 miles) southwest of the epicenter. The Japan Meteorological Agency described it as an aftershock of the massive 2011 quake. It warned that another large earthquake could hit in the next few days and urged residents to remain cautious for about a week. "Aftershocks could continue not only for five years but as long as 100 years," Yasuhiro Umeda, a Kyoto University seismologist, said on a talk show on Japanese broadcaster NTV. The meteorological agency said the bigger the earthquake, the longer the aftershocks last, though it didn't say how long. In some areas, water could be seen rushing up rivers, which funnel tsunamis to a greater height, but it remained well within flood embankments. It was eerily reminiscent of the 2011 disaster, when much larger tsunamis rushed up rivers and overflowed, wiping away entire neighborhoods. 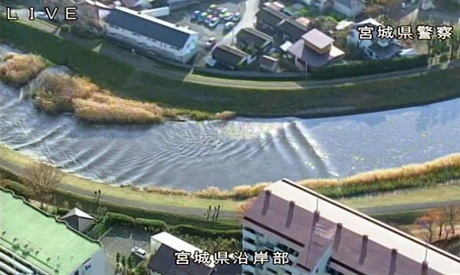 The first tsunami waves hit about one hour after the earthquake. The highest one, 1.4 meters (4.6 feet) in height, reached Sendai Bay about two hours after the quake. The plant was swamped by the 2011 tsunami, sending three reactors into meltdown and leaking radiation into the surrounding area. The plant is being decommissioned but the situation remains serious as the utility figures out how to remove still-radioactive fuel rods and debris and what to do with the melted reactor cores. Plant operator TEPCO said a pump that supplies cooling water to a spent fuel pool at the nearby Fukushima Dai-ni plant stopped working, but that a backup pump had been launched to restore cooling water to the pool. Both plants are run by Tokyo-based TEPCO. Naohiro Masuda, head of TEPCO's decommissioning unit, said he believes that the pump was shut off automatically by a safety system as the water in the pool shook. He said decommissioning work at the destroyed Dai-ichi plant had been temporarily suspended because of the earthquake. For many, the early morning jolt brought back memories of the 2011 earthquake and tsunami. "I remembered 3/11," Kazuhiro Onuki said by phone, referring to the March 11 date of the 2011 disaster. "It really came back. And it was so awful. The sways to the side were huge. But nothing fell from shelves." The 68-year-old former librarian is from Tomioka, a town that became a no-go zone because of radiation contamination. He was staying at what he calls one of his temporary homes on Tuesday. "I felt again that we should not have nuclear power," he said.